Not to be dramatic or anything, but two days after returning from our honeymoon, I got a text from my husband that changed our lives: I need you to drive me to the ER. Divorce is a death. A death of a united family. A death of future dreams and hopes. This death brings with it a heavy grief, weighing on the parties involved like a heavy blanket. As a friend, how can you support someone you care about experiencing such an emotional loss? Your tongue gets tripped up on the words you can’t quite string together the way you wish they would. You’re not sure if you’re making matters worse or if your compassion seems genuine or coerced. There are key moments in your life when you are reminded how old you are. Then you start to panic - do I even know how to be an adult? Does anyone else remodel their entire house, and forget about their bedroom?! When we first moved into our house back in March the bedroom was the last place I paid any attention to. We had remodeled most of the house and I was honestly just feeling a bit drained both mind and pocket. So I left the master bedroom alone. Yes I had painted it a pretty color, and yes we had installed new handscraped laminate floor, and yes I painstakingly removed the popcorn from the vaulted ceiling, but all I wanted to do was put the bed in the room and be done. So we did. It stayed that way for a few months actually; mostly because I just couldn’t decide what to do, and really a makeover wasn’t in the budget this year. I stumbled across vintage botany prints, I fell in love with the illustrations and I knew I could do something with these. The ones I had found were hundreds of dollars for one framed print- Yikes! That wasn’t happening- So I turned to the internet and found some free prints online! I printed my selected images on Epson Velvet Fine Art Paper, and framed them in my existing 16x20in frames with 8x10 mats inside, and my room makeover began! Once the inspiration kicks in it’ll make you want to keep on going. I still have 2 large pieces i want to add to the room, but for now, it’s looking pretty! As we were renovating and setting up our new home, I was looking to add unique pieces that would be timeless and fit the modern, eclectic style I was working towards. 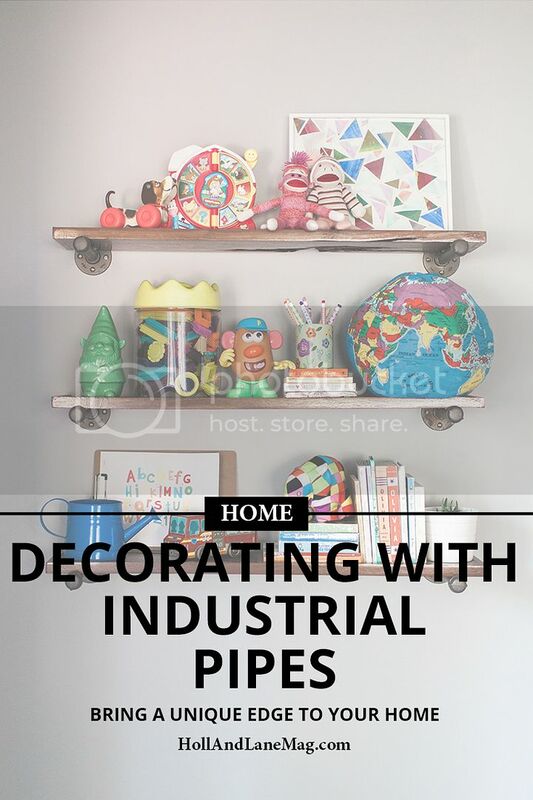 The use of industrial pipes for furniture and shelving was something I wanted to create and use in our home. To start, I wanted to create a large entertainment stand with shelves that could be used for our TV, storage, and decor. To begin the process of making the entertainment stand, I started at a local lumber yard that my father-in-law referred me to. The lumber yard was a hidden gem! Family owned and made up of barns with thousands of pieces of lumber to choose from. At the lumber yard, I saw some pieces of dark walnut with streaks of blonde that I had to have. I loved the warmth of the walnut but the uniqueness of each piece. We went home with six pieces that we used to construct our entertainment stand. The next step was buying the industrial pipes and flanges to put the entertainment stand together. I searched online and found an independently owned hardware store that had the 12 inch x ¾ inch pipes and ¾ inch flanges for a price that could not be beat. With all the materials ready it was time to construct the entertainment stand. Luckily, my father caught hold of my vision and offered to assemble the entertainment stand. He created a piece that is one of a kind and fits perfectly in our space. The designing and creating of the entertainment stand went so well that I was inspired to add more industrial pipes into the room. The next creation was three floating shelves made of walnut lumber, 10 inch x ¾ inch pipes, 8 inch x ¾ inch pipes, ¾ inch flanges, and ¾ inch caps. Currently, these shelves are kid centered by storing toys, art supplies, and books in an aesthetically pleasing way. The final use of industrial pipes was our mantel. My father-in-law gave me a piece of reclaimed wood that fit perfectly on our brick fireplace. This incredibly heavy piece of wood required 6 inch x 1 inch pipes, 4 inch x 1 inch pipes, 1 inch flanges, and 1 inch elbow brackets to hold it up. The mantel is an impressive statement against the large brick wall. A joint effort of vision, labor, and creativity brought industrial elements to our family room that are timeless and unique. Jan Verhoff is a licensed elementary teacher that found a passion for interior styling while renovating and setting up her new home. The passion lead to Jan starting an Instagram account of her home @spicysaltysweethome in order to inspire others. Jan is currently working with clients to help them style their homes. We purchased our 1960's home back in 2010 and did a complete DIY remodel of the interior. My husband and I spent countless days and nights dry walling, installing kitchen cabinetry, new flooring, lighting, painting and the list goes on and on. We first updated our dining room in the spring of 2011. Over the last couple of years my decorating style has really evolved into a modern farmhouse feel. I'm now a stay at home Mama and recently decided to do a refresh of our dining room to lighten and brighten the space up! Since I am staying home with Beckett and no longer have my home decor shop I still need to have a creative outlet! With that comes lots of DIY projects at home! In designing the refresh I needed to keep in mind how my new fixtures, colors and decor would pair with my current table, chairs and sideboard. For the first project in the dining room we removed the old chair rail and patched all of the damaged areas of drywall. This included lots and lots of sanding, priming and painting. The room previously was a deeper gray above the chair rail and a cool blue hue below it. I knew I wanted to I choose just one color for the room that was much lighter to really open the space up. I went with Behr paints Dolphin Fin. It's perfect in every light of the day! Once the walls were painted I moved onto repainting the trim work white. I also upgraded the base trim to a much wider trim size to update the space. It also lines up much better with the ugly baseboard heat runs, almost blending them in with the trim. Once the painting and construction portion was complete it was time to update the fixtures and the decor. I found gorgeous white patterned curtain panels by Tommy Hilfiger at Homegoods and woven wood blinds from Lowes. I think the wood warms up the space just enough. My jute rug is from Target which I found on clearance for only $99. What a score! 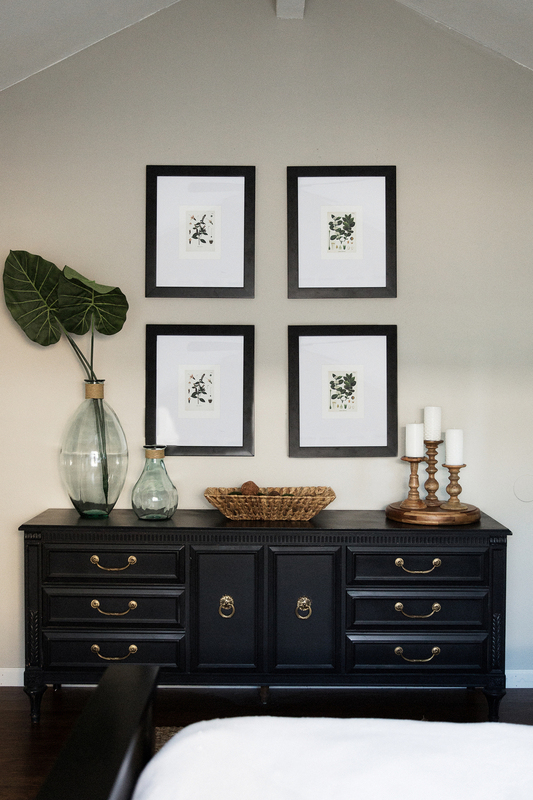 I already had my gorgeous sideboard from Joss and Main which stores my serveware and dishes. My farmhouse table and chairs are from Pier 1 Imports and I had actually purchased their floor model at a fraction of the price. I also decided to change out my older black iron chandelier for a creamy drum shade chandelier from West Elm. It casts such a soft light in the room. Lastly I found an amazing reclaimed wood industrial cart from a local shop in Medina, NY- Ellen J Goods. It's the perfect accent piece to this room and it serves so many purposes. I hosted Easter dinner for 18 people this year and it was the perfect drink station. 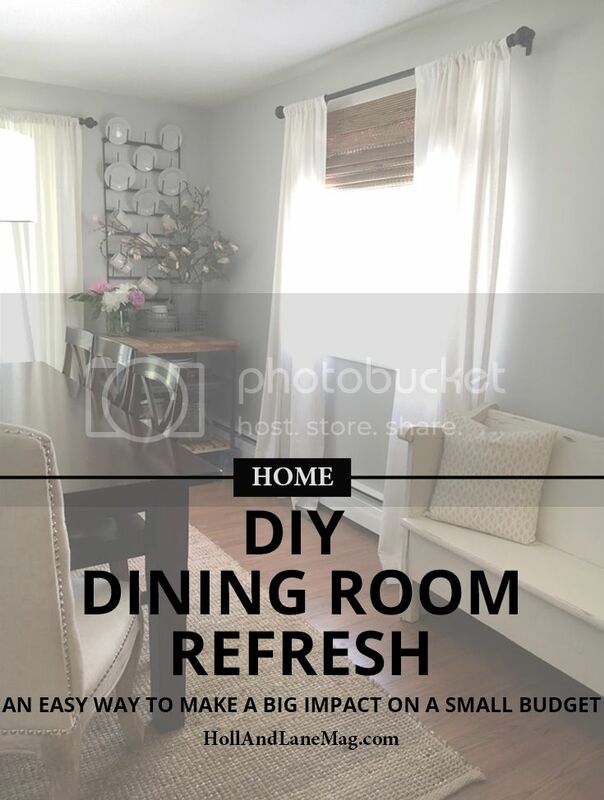 I'm so thrilled with how our DIY dining room refresh came out! It's exactly what I have envisioned. Sara Spoth, a twenty something wife and stay at home Mom with a love for anything DIY and design, she enjoys scouring flea markets and antique shops with her family for one of a kind pieces to reimagine. She is constantly looking for new ways to challenge herself in the design world, from home decorating to wedding and party styling. Follow her on Instagram for more home decor inspiration. When we first purchased our loft in the city, we were dead set to make our slightly cookie cutter slice of heaven, into something a little more industrial and interesting. One way we knew we could achieve this was to switch out our regular bathroom door to a beautiful wooden barn door. This little renovation was a year in the making (we’re talking closing up one wall and opening another, moving electrical, drywalling, painting, etc, all the while working full time jobs), but when it was finished, it became our favourite thing about our place. Installing a barn door does not need to take a year. In fact, it is definitely a weekend project. Many hardware stores carry kits to install barn doors, whether it includes the door or not (ours did not), and can easily be customized to fit the needs of your home. We had to modify the door and the actual railing as they were too wide, so we used special saws in order to do this, but you can always custom order the door and railing to fit the size you need. Typical barn doors are oversized, so it’s important to measure your space before bringing it home to ensure it will fit or so you can plan ahead for the adjustments you will need to make. One of my favourite parts of this project was staining the actual door (we bought a raw pine door and chose a stain that we have used on other woodworking projects around our home), and I think it came out really great. Since we’ve installed it, it’s added the flair we are looking for and made our little city apartment into a home. To help support the door, buy a piece of wood to affix the railing to as this will help build in strength and stability, especially if you do not have a supportive beam above your doorway. We stained ours to match the door and add interest. There are many different types of barn door hardware - it’s important to find out what will work for your space. Make sure to add in the height of the door PLUS the wheels of your hardware to make sure it fits in your space. Kimiko is a project manager by day and a DIY enthusiast by night. She loves to bake, write, spend time with her hubby and friends in their loft, and travel! New York City. It's where I always dreamed of living. The place that I was lucky enough to live in for four years. It's the place my husband lived in for nine years and made so many memories. It's also where we met, fell in love, and got engaged. It's the place where we made our first home. There were so many firsts so to say we love it would be an understatement. Our love runs so deep for that magnificent city. So when we bought our first home in rural Indiana, a big change from the bright lights of the big city, we wanted to do a little something to pay tribute to our beloved city we once called home. I can't remember exactly how or when, but we decided we should do a wall in our house to look like a New York City subway stop. I know, kind of weird that we'd want to tribute the grossest thing in the city (other than the trash in the streets). But it sounded cool and it just so happened that we had a bare wall in our entry way that was pretty perfect for it. Here's how we created a tile wall inspired by New York City. We found a cool mosaic sign from Etsy and we were able to put our street name on it. Then we trekked to Lowe's. Thank goodness for the guy at in the tile aisle because we just walked in there like we knew what we were doing. We grabbed our tiles and then I'm pretty sure we looked extremely confused because he ran over and graciously walked us through the aisles telling us what to grab. I seriously have no idea what we were thinking. The guy also gave us a few tips. And we set home to complete our project. Here's the step by step process of exactly how we went about tiling our wall. And since my husband did most of the work I use the term "we" pretty loosely. Make sure that the wall is clean and primed (if necessary). Ours was ready to go since we had originally primed over wall paper so we could paint it. Figure out where you want to put the sign. We aimed for somewhere close to the middle, but we didn't want to have to cut the tiles on all sides so we measured to be sure to put it in a place where the cutting was minimal. Pick your starting point. We chose to start at the ceiling and work our way down because we have wainscoting on half of our wall. Scoop up some mastic with the trowel and put it on the wall. You'll want to hold the trowel at about a 45 degree angle and use the jagged edge to spread it out. We only spread enough for one row at a time. You can do more, but we were worried it would dry. Start the tiling. We started with the upper left corner and pressed tiles into the mastic, getting them as close to the ceiling and as close to each other as possible. We ignored the very last tile because it needed to be cut and my better half wanted to do all of the cutting at the same time. Move to the next row. You want to stagger the tiles, so this time we started from the right. We did the same thing with the trowel and the mastic, pressed down the tiles and so on. Continue. We repeated that whole process until we came to the area where we wanted to put the sign. Add the sign to the wall. Since it's super heavy, we wanted to be sure there was enough mastic on it to make it stick so we put the mastic on the sign rather than the wall. We held it on the wall for a bit and put a row of nails below it to secure it in place. Back to tiling. This is where things get a little tricky. Using the same methods as before, continue to tile the wall. We tiled around the sign using the rows above as a guide so we could stagger them correctly. And, again, left any cutting for later. Keep tiling. And this is also a tricky party. We didn't tile the row directly below the sign because we wanted to give everything time to dry and those needed to be cut. So we moved to the next row and used a level to be sure everything was level as we finished the rest of the rows. Cut all of the pieces. We measured all of the gaps and I do mean all. Don't assume that one gap is the same size as another especially if you have an old house. My grandpa always said "measure twice, cut once." So that's what we did. When using the tile saw, it will throw grimy water everywhere, so it's best to not use it in the kitchen unless you have lots of drop cloths. Also be sure to switch out the water every so often. Add cut pieces to the wall. We used the same tiling method as before. Some of the pieces were small so we applied the mastic directly to the pieces and stuck them on the wall. Pull the nails out. Once all of that's done, the mastic behind the sign should be dry enough and you can pull the nails out. If you're worried, you can leave that for later or the next day. Just note that it needs to dry a long time before grouting. Let dry until the next day. Mix the grout. We followed the directions on the package to an extent. The ratios of powder to water were a bit off and ours was way too thick so we had to add more water. It should be a peanut butter or toothpaste consistency. It's probably best to mix the grout in batches since it's really hard to stir. And don't mix it with a paint stirrer. Apply the grout. We started from the bottom up, working in sections. We used the float tool and put lots of grout on it. Then held it with the long end at a 45 degree angle and spread it on wall to fill in the cracks, making sure that everything was filled in before moving on to the next section. Continue with the grout. We found that the sign had pulled away from the wall a bit and pushed some of the tiles with it. Everything was stuck well to the wall so we pressed it down a little and then grouted it and it seemed to be fine. Get rid of the excess grout. Once you've finished with all of the sections, you'll have some excess so hold the tool at a 90 degree angle and scrape along the wall to get the excess off. Let the grout sit. We followed the instructions on the package for how long to let the grout sit. Then used the sponge to clean off any additional. Do not let any grout dry on the tiles. Even the Lowes guy warned us about this. Let grout dry for 24 hours and admire your work. We found there was a filmy residue left behind. So after letting the grout dry for about 24 hours we wiped the wall down with a rag and a non-abrasive cleaner. Just a little side note, if you're trying this yourself. The steps may vary as it depends on the size of the wall and other factors. Also keep in mind this was our first tile job ever so we are by no means professionals, but it's still standing so that has to say something. Owner of Chaotic & Collected Blog & Stationery store. Former Brooklynite. Newlywed (ish). Lover of DIY, Crafts, bacon, blueberry jam, & coffee. Meticulous organizer. Fan of Food Network, HGTV, horror movies, & Catfish (the TV show). Maker of pretty handmade goods. Cooker of yummy foods. Recently, my daughter started to balk at the perceived "little girlness" of her room. And I understood. 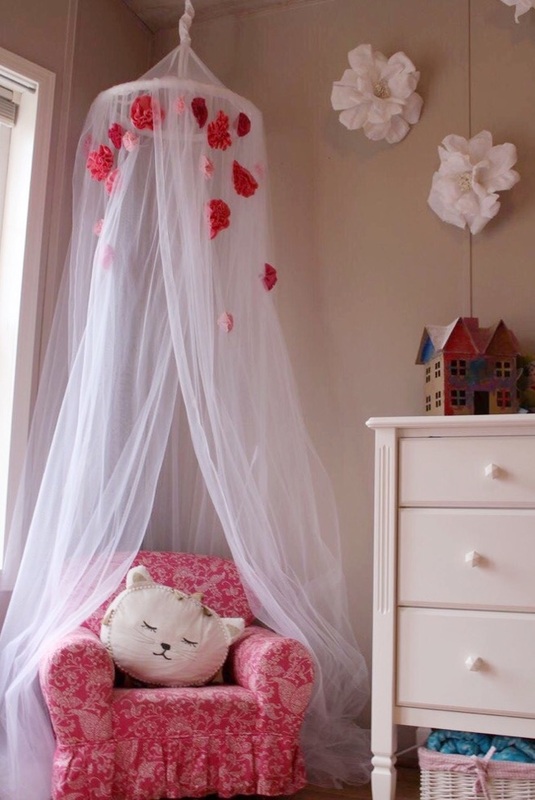 As cute as her room was, it was painted a pale pink and filled with white "shabby chic" furniture, as well as floral bed linens and window coverings. Adorable for a 3-year old, not so adorable at 13. And though I was open to changing things to make her happy and bring it up to a more appropriate look for her newfound maturity, I did have a few concerns. First, I had spent a fair amount on her custom window coverings and I wanted to work the new room around those rather than spend money changing them. Second, I wasn't willing to buy new furniture so we needed to make the new decor work with what we already had. After talking to her to get an idea of what she wanted, I quickly realized that the white painted furniture would be fine, however, the floral (and expensive) roman shades, not so much! She wanted a black and white room, with a touch of hot pink as an accent. But after much discussion and back and forth, we decided to keep a pink palette, but to brighten it. She loved the "PB Teen" look so that is what we tried to replicate. There is a fair amount of pink in her shades, so it actually worked with the brighter pink we brought in. We kept the bedding mostly neutrals, using whites with just a pop of the hot pink. We changed out accessories and pared down a fair amount (she wanted a "cleaner" look), but I think all in all, it turned out great. We ended up with a hot pink and white room, with just a few black and white accents. And more importantly, she's happy with the result. And as we all know, a happy teenager = a happy mom! Sheila Irwin is the writer/creator of the lifestyle blog, Maison de Cinq. She writes about fashion, food, and interiors, but her emphasis is on the interiors. She recently pursued her dream of starting a blog and decided to funnel her creative abilities into her writing, as well as transferred her styling abilities to interior design. Irwin is now working with clients to transform their homes the same way she previously transformed wardrobes. First you must NOTICE how you live. Whether you are gutting your kitchen or just refinishing the current layout, this step is the key to creating a space that serves you. People often jump too soon into choosing products and features before doing the necessary self-examination. In this step, it’s important that you are honest and let any “romanticized” versions of yourself go. Sometimes we like to imagine the way we wish we were, like only using our kitchen to prepare lavish meals for friends and family, rather than the reality; which may be that your kitchen is the hub of frenzied family time, kid’s homework and hurried meal prep. I always start my clients with this step so we can find the tools and layout that support their life exactly how it is, quirky habits and all. I encourage them to journal for a week and write down answers to questions like: Where do things pile up? Where does the room get messy? What activities take place in the space? If you cook, what type of cook are you? Gourmet or quick and easy? What appliances do you use every day? Are there activities that you do that aren’t easy to accomplish? For example, do you pay bills in the kitchen, only to make multiple trips back to your office to fetch envelopes and stamps? Do your kids do homework at the table and leave a mess because, heaven forbid, they walk everything back to their room? Once you have identified your living habits, you can come up with solutions that may even be unconventional. For instance, moving those cookie cutters you only use once a year out of the kitchen and dedicating those drawers to pens, stamps, envelopes, etc. so when it’s time to do your regular activities, you can do so and clean-up with ease because your space serves the “real” you. In this kitchen, we did a combo of gutting, while keeping gas and plumbing hookups where they were. This cut down on construction costs but still allowed us to create more counter space which she needed for cooking and home canning! This client also enters through the back door with groceries, so moving the refrigerator to the back corner worked for her functionally. Now it’s time to get real about your future plans: Is this your “forever house?” Or do you plan on selling/renting it out later? The answer will shed light on how much you want to spend and what products and finishes you should consider. This kitchen will not be my clients’ forever home and she plans on renting it out later. Therefore, we decided on more durable materials. She loves marble counters but it wouldn’t have been smart to install something that a renter might not maintain as well as she would. We opted for a quartzite that is heat and scratch resistant. For the floor, we did an inexpensive porcelain that is zero maintenance and resistant to breaks. 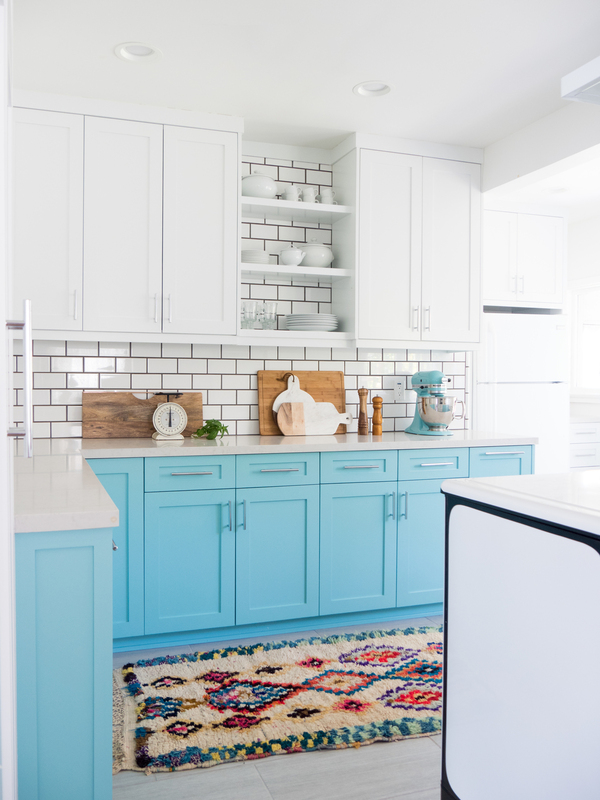 For clients in their forever house, I would have opted for the countertops and flooring of their dreams because when you have found that special home, it’s time to go all out! Lastly, I tell people not to be scared to make a style statement in their kitchen. We spend so much time there and it should make our eyeballs happy! If it’s your forever home, you can choose more permanent elements. If you like to change things up every few years or plan on selling/renting, then I suggest being more strategic. 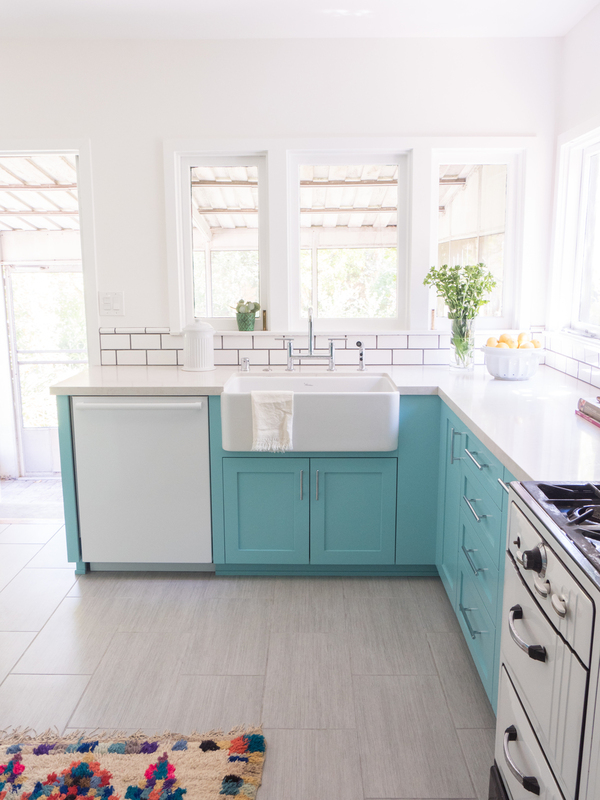 For this client, the cost of painting the lower cabinets later on was worth it to let her true style shine with bright turquoise. To balance it, we went with all neutrals on the counters, backsplash, upper cabinets and appliances so anyone could walk in and insert their stamp. Other options are to paint the walls a fun color or invest in interesting lighting fixtures that you can replace and take with you. Even less permeant options include: throwing a rug down or hanging some art on the walls. A kitchen remodel is an investment of time and resources. It’s worth it to go through these seemly theoretical questions to insure you create a space that’s perfect for your unique lifestyle and stage of life. Jessica is the owner and head designer of Glamour Nest. Her style can best be described as “Casual Glamour.” She's a laid-back gal who LOVES fancy things – the girl who wears ripped-up jeans with Valentino’s at backyard barbecues and serves Friday night pizza on her best china. She loves to incorporate that feeling of Casual Glamour into all of her designs believing that everything should be able to be touched, used and enjoyed. You can see more from Jessica on her blog, Glamour Nest. Organic. Natural. Modern. When I moved from New England to California, my inspiration from the rugged mountains and the ever changing Pacific Ocean really came down to those three words. With my new temperate climate, I was thrilled to accept the challenge of merging outdoors with the indoors of our Santa Barbara home. Wherever you live, embracing the elements of nature is sure to beautify any home. Our home is very bright with lots of floor to ceiling glass windows and doors. The primary color is white, so I love to use fresh flowers, olive branches, large tropical leaves and trees to add color to our abode. Tillandsias (air plants) pocket the nooks and crannies throughout the house. Sun smoothed beach rocks are stacked on the mantel of our rarely used indoor fireplace. Rarely used if you don't count the candlelit driftwood candelabra that harkens back to the sea. Spectacular colored sea glass, gathered from long coastal walks, grace the center of the dining table in a huge flat bowl. I also use different woods generously to warm up our modern home. The centerpiece is a large farmhouse table that is made all the more natural by the patina of use it has accrued from dinners and crafting! One of my favorite pieces is a wooden elephant side table on whose back rests a graphic striped vase that always contains some manner of garden leaves or branches sprouting from it. A large driftwood branch found on a trip to Big Sur, leans against the fireplace. The wide planked oak floors running throughout the house, further lend a coastal vibe. All of these elements combine to create my California style…organic, natural, modern. After relocating from Westport, Connecticut to Santa Barbara, interior stylist Elizabeth Burns was immediately inspired by the more relaxed lifestyle that California offered. This inspiration led to the creation of edb designs. With a passion for interiors that emphasize comfort and function, she recognizes that a home has to have a soul and embody the personality of its owner. Elizabeth is dedicated to creating spaces that are comfortable, unique, and organic, which is embodied in The Little Glass House. I had a functioning dining room but it wasn’t completely functional. I needed to make some changes. It wasn’t a full out re-do. The floors and some furniture are still the same. I had to figure out a few things that suit my family, and ponder over a few questions to decide what I really needed. One question I had to answer was: how do we live in our home? Sure, we have a bunch of different rooms but do we live in them? We don’t. What I mean by this is how much time we spend in an area on a daily basis. We sleep in our bedrooms, but we don’t hang out in them during the day. We have three areas, (four, including the basement) that we actually live in daily. I needed to get the most out of my space. The three areas we use most often are the kitchen, eating area and living room. These spaces are an open floor plan and I felt like I had a lot of unused space in the eating area. The flow and energy of the room was off which made it less functional. I had to ask myself what could change it for the better. As you see in this picture (above), I had a wonderful table that I’m still quite fond of. It was whimsical with mismatched teal chairs. I’m still a huge fan of the look of my previous set up, but I needed to make a change to utilize my space. The long table sitting in the middle of the room created a barrier. To me, it blocked the flow of daily life in the room. I have family and friends over for dinner often and naturally we always gathered at the kitchen island, which could only seat four people. No one really minded and we would happily stand around it and eat together. However, there was a huge empty table that no one wanted to sit at right next to us. Gather. That’s my key word, I needed a gathering table. So, I went shopping and ended up getting my pieces custom made. I went to the best furniture makers I know around me - the Amish Market. They made me exactly what I wanted and I couldn’t be happier with the results. I wanted a square table, something big and chunky. I wanted something that would be solid, take beatings from toddlers well and it had to be beautiful, of course! The table is 70” square; everything is over sized and chunky, just how I envisioned it. It’s made of maple, the table tops are scraped so when my kids bring their toys on it another little scrape doesn’t matter. I got the bar to face the living room, whereas my kitchen island faces the opposite direction. Seating options, please! Ironically, the chairs are from Pier 1 and they just happened to match the stain on the tables perfectly. They are both called tobacco. The chunky legs on the table and bar are a farmhouse style and they fancy up my home just enough. Now, when my family comes over we can gather in the eating area. We have options. Some like to sit at the big square table, others still at either of the islands. Either way, we are sitting. The energy flows better now that there isn’t a long table in the middle of the room. And, I feel like I am utilizing all of my space. Making changes, especially changes that you hope to be permanent are always a little scary. If you sit on your ideas for a while and think about your options, ask yourself what you truly want and need, the results are usually worth it! I can see this furniture growing with my family, and I am thrilled with my results. Caitlin Paulson is a home decor enthusiast. She grew up playing in her father's steel yard, full of rusty metals and old machinery. This pasttime turned rustic industrial decor true to Caitlin's heart. My daughter's room started off very small. Originally, there were doors everywhere the bedroom door, a door to the bathroom, and sliding closet doors. Those doors paired with a bay window left only one wall with usable wall space. I first removed the bathroom doorway and closed up the opening to get a little more wall space. Even then we couldn't fit more than a bed and a bookcase in there. We still needed more space but there wasn't anywhere to gain it without a costly home addition. But then I had a thought, why do we need to have such a large closet? Surely my daughter's clothes could all easily fit inside a dresser. This idea played in my mind over and over again until I finally took the plunge and demolished the closet. It looked like a different room with how much space was gained. After that I tied in laminate flooring, painted the walls in a lovely, soft griege color and added paneling on the back wall where the closet used to be. I continued the paneling on the ceiling which gives a kind of waterfall effect and I replaced the old light fixture with a beautiful new one. I brought in white furniture to keep the space light and bright. The room before was so cramped and there was nowhere to do activities. Now, I separated the room into different activity zones. There is a zone for homework, reading, dressing, playing, and sleeping. You may be wondering if we miss the closet. The answer is absolutely not! The dresser has worked perfectly for all the clothing storage and I love that I can have baskets underneath for even more storage. This room is such a sweet space with lots of space to imagine and play in. There is nothing better then coming home from a busy day and being greeted by a happy home. Now some of you may think "a happy home, what does that even mean?" Well my friends, it means making your home a reflection of you and how you want to feel when you are there. The first step to evoking that happy feeling starts right at your front door, before you even step inside. For me personally, I love being greeted by a beautiful wreathe hanging on my front door setting the tone for what lies inside. So today I am sharing a really simple do-it-yourself summer wreath that is sure to make a statement and really dress up the entrance to your home. Whether you live in an apartment, town home, or a detached house we all have doors and what do we do when one closes? We put a wreath on it of course- and a darn pretty one too. For this project you will need a simple twig wreathe which you can find at Walmart or Michaels for around $5. Next up is some craft moss which is very inexpensive and again can be found at the above stores. Of course you will need some pretty faux flowers, I had quite a few options laying around from previous projects but you can literally use what ever you have, this is not an expensive project. Now you want to think about how you want your wreath to look, if you find yourself drawing a blank, Pinterest is a great place to get some ideas. I knew that I wanted something simple and minimal, yet not boring so I opted for using the moss, the white hydrangeas and a little bit of eucalyptus. I started by sticking and weaving the craft moss into the twigs of the wreath and took it about half way around. Next I took my flowers and bent the metal ends into the wreath being sure to attach them securely. I didn't use a hot glue gun because my stems were long enough to really wrap in there, but you could definitely use some if you need to. To finish off I added two sprigs of eucalyptus for a bit of whimsy and voilà, a simple and inexpensive wreath that will be sure to make you smile every time you get home. Sometimes it just takes some pretty flowers hanging on the door to make us happy- oh and coffee of course, coffee always makes us happy. 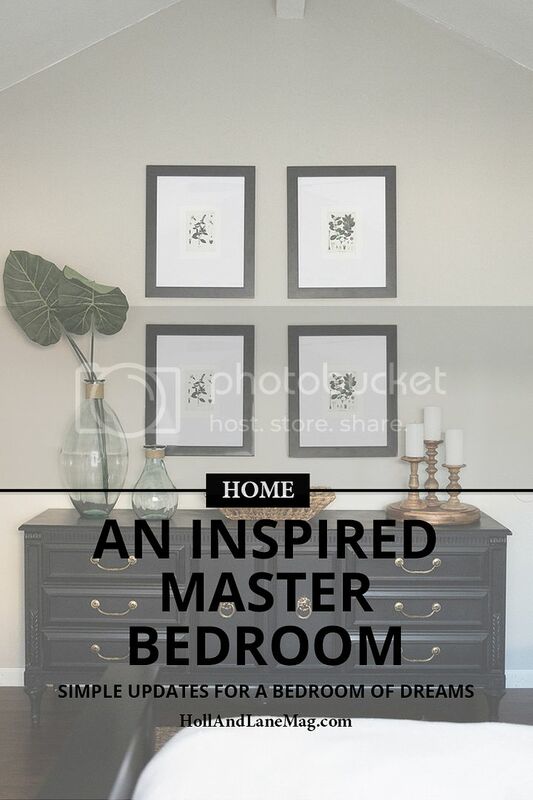 Pinterest is amazing (and a little addicting) for home décor inspiration- so much so that muscle memory has made the act of opening my Pinterest app and going to the subcategory “Home Décor” involuntary. As I scroll until my eyes go blurry, I pick and pin entire rooms, furniture pieces, and décor must-haves. Lately, I’ve been hooked on living rooms, focusing on the empty corners of my own living space that need filling. In an effort to spruce up my living room at a price that wouldn't hurt my heart, I went online in search of a second-hand accent chair in need of some TLC. With Craigslist and apps like Offer Up, Let Go, Wallapop, and Close 5, it’s never hard to find furniture pieces people are selling and all-too-willing to give up at a good price. After only about 10 minutes, I stumbled upon a $20 chair stripped down to its bones. It definitely needed some work; the entire back cushion was missing. Still, it wasn't a lost cause, and I was up for the challenge. To my pleasant surprise, I found it wasn’t too challenging at all. The first step, painting, was simple enough. I used chalk paint as it’s seriously the easiest paint to work- no sanding, priming, or anything is required as a precursor- just slap it on, and double up the layers if the first is too light. I mixed a charcoal gray and royal blue to get the shade I wanted. Once the paint was dry, I applied Minwax- Paste Finishing Wax to protect the paint and give the texture a smooth, polished feel. The seat cushion itself wasn’t in bad shape; reupholstering was as easy as layering batting and my chosen fabric and stapling both into place. Creating a back cushion was fairly simple too. I purchased a bare cushion at a fabric store and sandwiched layers of my chosen fabric and batting. Pulling it tight, I stapled it against the back of the chair. To finish the piece, I trimmed the excess fabric on both the seat and back cushion as close to the staple line as possible. To cover the unsightly line of staples, I created piping from left over fabric and cording using a sewing machine. Then with a steady hand, I glued said piping into place. One helpful tip here would be to move slowly; hot glue is not very forgivable on fabric. With a little bit of Pinterest-inspired styling…. A project like this is totally doable! It just takes a little time and effort at first, but it’s well worth it both for the sense of accomplishment and the financial savings of buying a brand new chair. I love to entertain, and I’ll use pretty much any excuse to get a few friends together for some food, drinks, music, and laughs. Three day weekend? Party. Rainy Sunday? Come on over. Just cleaned the house? Let’s do this. So once the weather turns nice and the days get longer, all bets are off. Whether it’s a few neighbors or the whole crew, there’s nothing like a garden party on a summer evening. To keep the festivities going all summer long without getting burned out, you’ve got to find that perfect balance. Easy enough to throw together at a moment’s notice, festive enough to make you excited to do it again next weekend. You’ll want to keep the focus on food, drink, and tunes. Everything else is bonus. There’s absolutely no reason to sweat it out in the kitchen while your guests sip drinks on the patio. Char up some summer vegetables on the grill or skewer some kebabs and you’re good to go. Hanging out by the grill with a beer while you chat with friends barely feels like cooking at all. I marinated these chicken kebabs in a mix of hoisin and hot sauce and threw some corn on the grill and voila. Doesn’t get much simpler than that. Well, unless you pick up barbeque and call it a day. That’s totally allowed too. Look, I’m not asking you to use your wedding china or anything, but it’s worth it to invest in some melamine plates or - my personal favorite - thrift store china in mixed patterns. Paper plates are wasteful and don’t hold up to messy barbecue or salad dressing. Oh, and please take those chips out of the bag they came in and put them into a bowl. Elevate your soiree with some proper dinnerware. You’ll look like an amazing hostess, and you can throw it in the dishwasher when you’re done. I love a good cocktail. I mean, I blog about them every week. But we’re sticking with the casual theme here, and that means you’re off the hook from bartending. Grab a bucket, a bag of ice, a few beers, and you’ve got a bar. If you’re feeling really fancy you can slice up some limes, but that’s optional. Don’t overcomplicate it. Instead, place a few potted plants around the patio. It’s not as fussy and they’ll last much longer. Plant some lavender, rosemary, or citronella, all of which repel annoying bugs and smell delicious. It’s not a party without music, so make sure you have something portable that you can play outside. A simple bluetooth speaker that connects to your phone will do the trick, but lately we’ve been enjoying our portable record player. Hey, I’ve even used the old phone in a bowl trick (don’t judge). Whatever you need to make sure you’ve got some summer sounds. Rock on. The first time I walked into our for-sale-by-owner house that was in dire need of TLC, I saw the potential it had and knew it was the right home for us. I loved it as soon as I stepped into it, but I also knew right away that I wanted to do something about the kitchen cabinets. The old hardware was difficult to clean and the color of the cabinets just made the kitchen seem dark and dreary. New cabinets were not an option since the cost wasn't in our budget of improvements we needed to make in our new home (well, it was new to us!). Also, it really wasn't a necessity like so many other projects within the house that needed immediate attention. So, I decided I would paint them. I only talked about this project for FIVE years until the week before a huge family get-together at our house motivated me to finally get it done. I will start by saying this wasn't an easy job, but it was worth it. The most difficult task was removing the old hardware. It had been there for a very long time and was difficult to remove. So, if you don't have to remove the hardware, you're in luck. After removing the hardware, I filled the holes with a wood filler and sanded those places once they were dry. I didn't completely sand the cabinets down before painting them. I just lightly scuffed them with a sanding sponge. After filling the old holes, I had to drill new ones for the replacement hardware since the new hinges would be inside the cabinet doors and the old pulls were a different size. I used a very good primer and paint to finish them so they would hold up to every day use. I would recommend a good quality paint and primer for your cabinets, especially a paint surface that you can scrub. I used Benjamin Moore's All-Purpose Primer and Waterborne Satin Impervo paint and they still look great after four years! We have updated so many things in our kitchen since then, such as lighting, wall color, and decorative accents. Not only has painting the cabinets changed the look of our kitchen, I love that my Grandaddy's old butcher block stands out now against the lighter cabinets. The paint and hardware made such a difference and gave our kitchen a whole new look. Although it was not an easy job to do, I saved a lot of money doing it myself instead of hiring a contractor. I have not missed the old look of the dark cabinets and love that our kitchen looks so much brighter now. 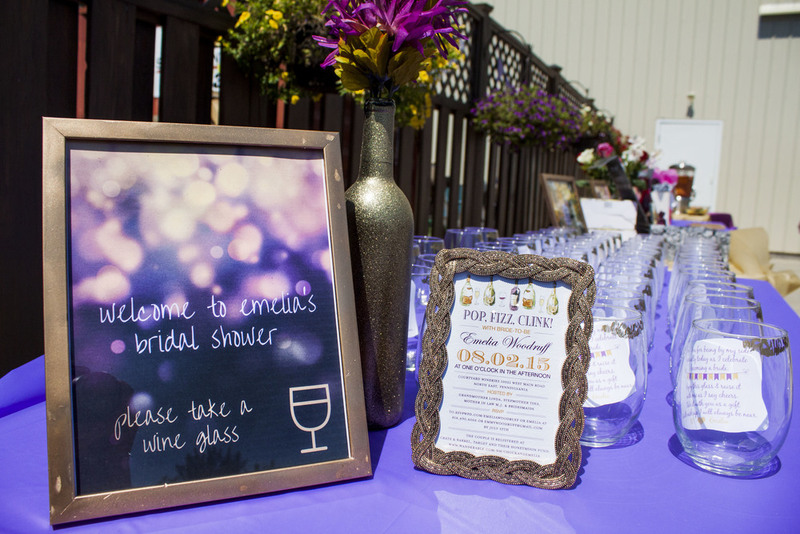 Choosing your bridal shower venue can be quite the process, but before my (now) husband and I were engaged we talked about our future wedding and how we would love to have it at a winery. 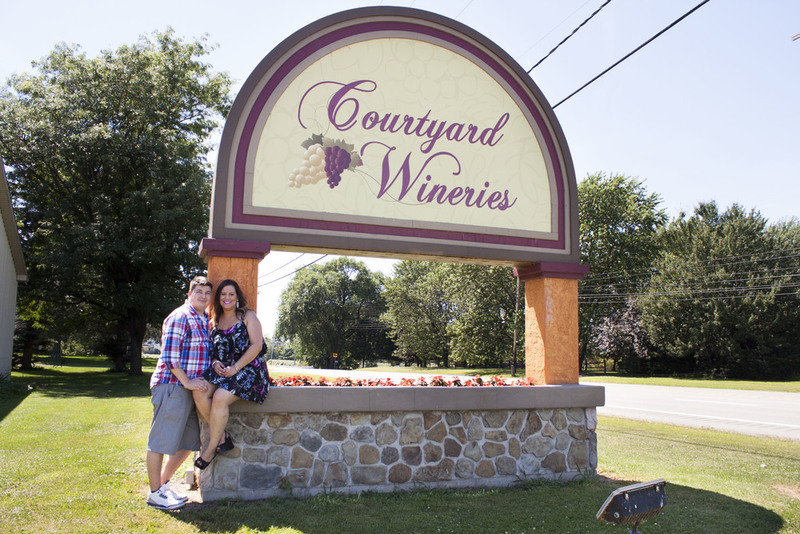 We began searching for a wedding venue only to find wineries in our area typically only hold a maximum of 80 people. While we wanted a small wedding, that was too many people to cut from our guest list. So deciding on a venue for my bridal shower came easy and was within my budget. I had no set theme for my shower, other than I wanted to bring in our wedding colors which were purple and gold. I had pictures and ideas that I had seen and desired to incorporate, but honestly I was wondering how it would all come together. The end result was better than I ever could have imagined. I made the majority of the details since I love DIY projects. I absolutely loved my fun bridal shower invitations from Wedding Paper Divas and how they matched the theme of my day and venue so I framed one of them and used it as part of the decor. The signs placed on different tables were designed in Canva, which is a great free tool. The centerpieces doubled as prizes for winners of the games we played. The wine bottles were purchased from the winery and were decorated with a tag I had personalized from Paperie Off Park and some gold ribbon. The other part of the centerpiece was provided on behalf of the winery and were colored glass bottles. I filled them with baby's breath and the whole centerpiece pulled together nicely. The wine bottles and large letters were made in a matter of minutes. It's pretty amazing what you can do with a can of gold spray paint. I removed the labels from the bottles and sprayed one with gold glitter spray paint and the other with plain gold spray paint that I also used on the frames for the signs around the winery. I purchased the faux flowers at the dollar store & the small letters for one of the wine bottles at Hobby Lobby. The large letters were spray painted gold and were from Wal-Mart, but you can find them at pretty much any craft store these days. A few framed pictures of the Groom and I were placed around at various tables also. I made a tassel party garland in purple and gold and hung some banners from my bachelorette party that were a beautiful, special touch. The winery did wine tastings and the guests were able to enjoy glasses of wine, but I also wanted some other options for beverages. I had a delicious summer sangria and also an an infused strawberry, lemon & basil water. The sangria was a HUGE hit and the coordinator from the winery asked for the recipe because he was impressed on how much everyone loved it. The menu was created with the help of one of our best friends and groomsmen, Mike. He is an amazing Chef and graciously made everything. I can't tell you how many compliments we received on the food that day and he made sure it was all perfect. We had everything from fresh fruit to bruschetta to pork tenderloin sandwiches. It was perfect for a warm summer day and was so delicious. I could eat cupcakes every day for the rest of my life and the delicious ones served were from a local baker, AllieCakes. 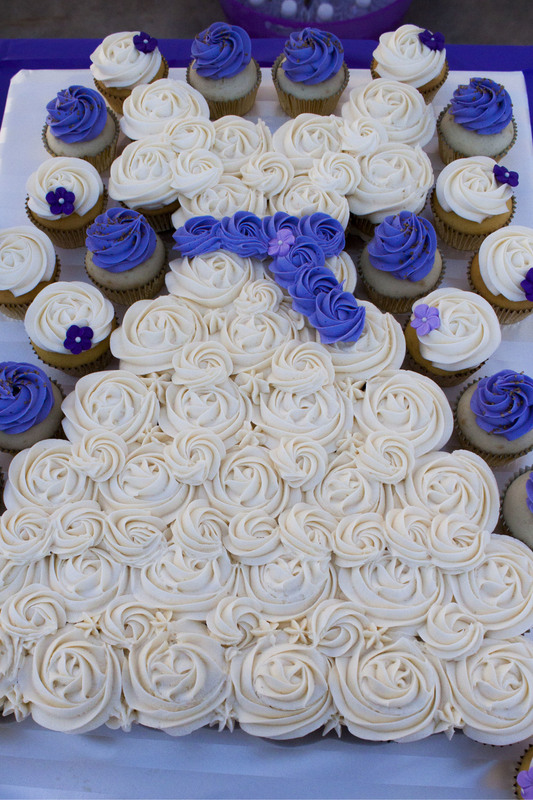 She didn't tell me until after the fact, but it was her first time making a cupcake wedding dress and she nailed it. I loved the way it turned out! I chose 2 flavors for the cupcakes..an almond and a lemon, both with vanilla frosting. They were so good and luckily she was also our wedding baker, so we got to enjoy those tasty cupcakes again a month later on our big day. I chose wine glasses as favors for each guest with a thank you inside. Can you believe that I found them from the Dollar Tree for $1.08 a piece when ordering in bulk? The touch of gold lips was applied easily and the step by step instructions can be found in a post about my DIY drinkware . I wanted to have something for my guests that they could frequently use, and it tied in with the venue so that made them even more fun. I added a poem as a thank you to place inside the glasses also. My Maid of Honor had the great idea of a Words of Wisdom Station. We cut out purple hearts and had everyone write their marriage and love advice on them. I loved reading them and will keep them forever. I also wanted a guest book and had a few ideas, but my final decision was to use a wine bottle from the winery to have everyone sign, and it's now on display in our home. I also made the flowered "L" and used it again at our wedding. I am so happy with how it turned out and got a lot of compliments on it so that made it even more special. As we played games that I created in PicMonkey the winners got tickets to enter for baskets made by my bridesmaids & family. They also got tickets just for coming, woo-hoo! Everyone had a chance to win so that made it fun. We played Bridal Bingo while I opened gifts, which kept everyone occupied and made me feel a little less nervous during the process. One bridal bingo card per table was marked on the back and that person got to take home the bottle of wine from the table. A few shops and sites I used: The personalized napkins were from Memorable Wedding on Etsy. I highly recommend her shop for the inexpensive price tag and quick shipping. The Printable Gal from The Sequin Notebook blog reached out to me and offered to make some adorable straws for my special day. She worked with me to find out my vision, colors I wanted and offered some fun suggestions. I absolutely loved having a piece of one of my blogger friends incorporated in to my bridal shower drinks! Planning an event so important can be a lot of pressure, but when you nail down the details and make it your own it all comes together. I absolutely loved every second of planning my winery bridal shower and enjoying a beautiful day with my loved ones. Be sure to use your resources and use the lovely world around you as inspiration. I’ve always enjoyed the occasional rainy Saturday thrifting, but it wasn’t until my husband and I bought our first home that it became an obsession. We had a house to fill, and thrift stores allowed me to satisfy my desire for decor with character that also fit our budget. If you come into my home, you can be pretty much guaranteed to be regaled (or, um, bored) with stories of my favorite finds. I love bringing pieces into our home that have a history, that might have otherwise been trashed or forgotten, and that give plenty of bang for the buck. Today I’m sharing my tried and true advice for buying and decorating with thrifted items. This is way more fun than it sounds. Peruse your favorite home design magazines, and take notice of both individual pieces you love and how they fit into the context of their room. I love vintage sites like 1stdibs and Chairish for this task. They have beautifully curated collections and frequently include descriptions with more information on year and maker. Familiarize yourself with the styles and names you’re drawn to; don’t worry about the prices. Yet. Thrift stores are overwhelming. There are rows and rows of... well, junk, and you’ll make yourself crazy inspecting every last object. I keep a running list of items I need for the house that goes from the specific (patio bar stools) to the general (art). You’ll have better luck and more fun if you’re able to gloss over some items at the store while you search for what you actually need. That said, always keep an open mind. I went out one day looking for a planter, and came home with a dining table. What can I say? That’s the magic of thrifting. It can be difficult to train yourself to look past the inevitable dust and poor lighting of a second hand store. So this is where your homework pays off. Keep an eye out for the lines and finishes you like. Don’t be afraid to move other objects out of the way to get a better look at something, and be sure to mentally dust and polish while you’re at it. I once almost walked right past a gorgeous burl wood and brass Milo Baughman-style table that was hidden under a pile of tchotchkes. I’d done my homework, so I knew that similar tables went for ten times the price they wanted for this one. I brought it home, treated it to some much-needed TLC, and it’s been looking great ever since. You’ve done the homework, you’ve hunted, and you’re starting to see the diamond-in-the-rough possibilities of countless items. Hold your horses. After all that time and effort (and trust me, any successful thrifting trip will include both), it can be tempting to bring something - anything - home. If I’m empty-handed after a long day of thrifting, I can start convincing myself of some strange things. Like that old print just needs to be rematted and reframed and maybe repainted a smidge to look perfect. Or that maybe I need a second set of dining chairs just in case. So before you buy, be brutally honest with yourself. Is this faux malachite tray really going to clean up splendidly and look great on your coffee table, or is it just the best option in the red tag basket by the counter? Avoid making exhaustion purchases. The thrift stores will still be there next week, with new items to boot. I know it’s uncomfortable, and trust me, I used to hate it too. But most thrift stores are ready and willing to drop a price if you ask nicely. I always start with a simple, “Is that the best you can offer?” If you’ve done your homework, you’ll have a better idea of what’s fair and what’s unreasonable, but at the end of the day you should be prepared to walk away from anything that’s not in your budget. Once you finally hunt, haggle, and clean that thrifted treasure, it’s time to give it a home. To avoid turning my home into a thrift store reproduction, I mix old and new with high and low. That might mean hanging a classical painting next to an abstract on a gallery wall, or setting a rustic plaster sculpture on a refined brass table. The goal is a layered, purposeful look. Because those thrift find stories are way more fun when the finds don’t look so thrifted. 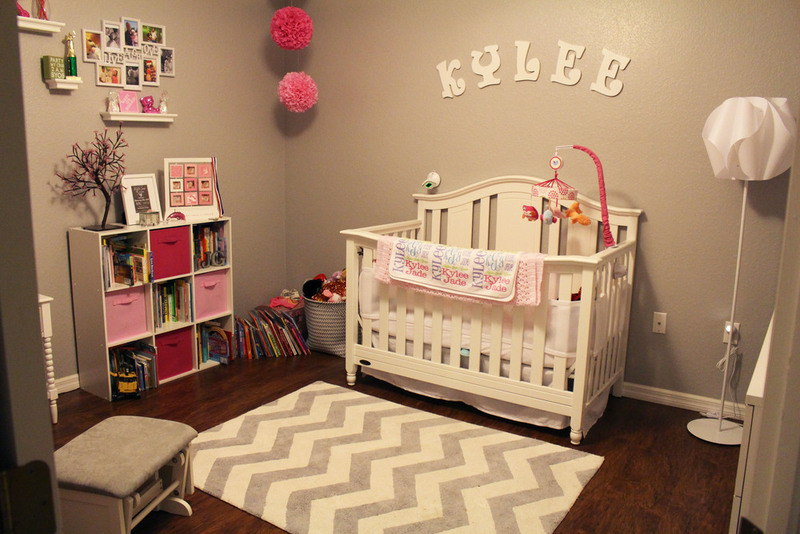 My name is Bridget Kyner, I am 27 years old from Englewood Florida, and my Favorite Room is my 11-month-old daughter Kylee Jade Green's nursery! I have wanted to have a baby since I was 16 years old. My older sister had my nephew, who I helped raise, making me fall in love with babies and have baby fever. However, I successfully waited until I was older. My fiance, Mike Green, and I have been together 9.5 years this month and struggled for 2.5 years to get pregnant after finally deciding to have a baby before his Grandma, whom we were very close with, passed away. We successfully got pregnant 4 months later. And we had our baby exactly a year to the day our Grandma passed away, February 27th, 2015! We believe in our hearts that our Grandma got to meet our sweet Kylee, somehow! Now, on to her room ... It was inspired by Instagram and Pinterest. I love the color pink and while I was pregnant I hated [and still do] all the themes they have for baby rooms! I just could not pick. So I came up with a color scheme of different color pinks, grey and white instead of patterns or a themed room. It came out picture perfect as I imagined. Mike also wanted to be involved, unlike a lot of guys. Mike chose the white furniture which I was very hesitant about at first, but now I think it's beautiful. And keeping it clean is surprisingly not a problem! I chose a dresser with a changing pad instead of a changing table because I felt it would be a waste of money and space. The crib was something I did not want to draw attention to, so I went for an all white color scheme. The rug was a last minute decision, as we could not find any we liked but knew we needed one, and even though it's chevron pattern it worked well in the room. The color on the wall is called Petal Grey high gloss from Home Depot. We originally had a white valence on the window which did not look right and last minute I found the curtains that are there now which I fell in love with! The rocking chair and its location was a huge concern, as I wanted a specific set that would fit in the room. My sister ended up giving us the perfect set as a gift. Because of a local company called Pregnancy Solutions in my town I take weekly voluntary educational parenting classes and in return get free baby items from their company- most of which you can see in the closet. On the walls we kept it minimal- family pictures, cute colorful things, Disney characters, monogram items, keepsakes, name initial items, her first trophy from her first local pageant, Little Miss Englewood 2015 at 5.5 months old. And lastly on the back of her door is the biggest headband & bow collection ever! We have over 300+ and counting. It started as a tiny basket and has skyrocketed. I struggled to find ideas or something big enough to accommodate this large of a collection and this 'shoe rack holder' was the only thing that did the trick. It came out better than I hoped! I waited many years to have a nursery and some friends told us not to waste our money on a nursery but I don't regret it one bit!